Underlying almost all of the discussion about LMGs is their use for room clearing. Once grenades work realistically, using any gun--LMG, automatic rifle, SMG, shotgun, whatever...for room clearing will be very Old School. So really, that's a part of the discussion that's a waste of energy. It's very easy to deploy the bipod, just right click. It WOULD be very easy, except for one thing. The game will not let you deploy the bipod unless the surface you're deploying it on is JUST the right height in relation to the avatar. In RL, that isn't a problem, as people can move anywhere from fully prone to standing, stopping at any point inbetween. However, with the game just having three positions, it's impossible to set the bipod properly in many situations. I can't tell you how many times I've wanted to deploy in a window or on a top of a sandbag, but have been unable to without aiming unrealistically high or low enough to be useless. The bipod shouldn't even have to be deployed in those situations anyway. If the bipod is planted on the ground, that's fine, but the bipod shouldn't even HAVE to be deployed on sandbags or in a window, where the weapon could just rest on the horizontal surface; either the top of the sandbags or the window sill. yeah, the deployment clips everywhere. forgot to add it to the bug report and proposed audit list. RATS, is there a ticket for it? How about we just go straight to the end game instead of creeping toward a goal? Slow down the rate of mouse movement depending on weapon weight for ALL weapons. Start at 1 percent per pound and then adjust as needed until you get the right “feel”. 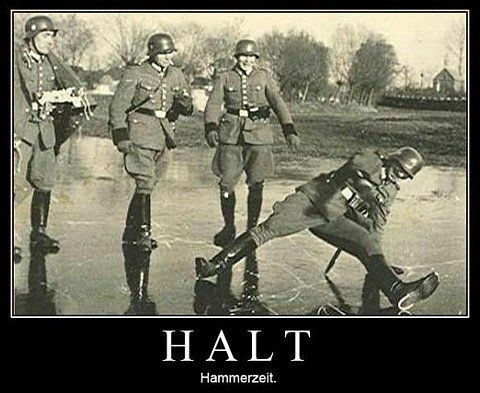 But keep the reduced movement rate at a consistent percentage per pound across all weapons to make it fair. You poor thing. It is simply unthinkable that CRS would even considering the notion of basing a weapons in-game mechanics on real-world capabilities. Enough to make your spine tingle at just the thought of it. A) "It has been this way for 17 years, unfair to change it now"
"I don't use the weapon like that anyways, nothing to see here..."
I can't decide which of these is more pathetic. If I had the choose, give me an "A". Its the infantry collider and how it carries out in 3rd person. Xcas, ok since you want stats I went and dug somethings up. 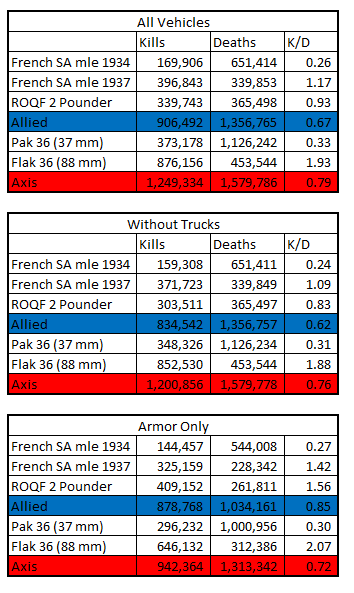 I went to the stats.wwiionline.com and did a comparison of Previous Campaigns for the British LMG, French LMG and Axis LMG and removed everything except infantry. Again not a single CRS member has said this will happen. Its a discussion. Threatening to quit and getting irrational is not productive and most likely why posts were hidden. I didnt hear you complain when the British Grenadier HEAT round was removed from the game completely. We want to know how to fix a game mechanic here, and do this in a way that alters the Rambo factor but preserves the original utilization of the LMG class. This is a pretty cool report. I would love to see a report like this that looks at the pak 38, 6 pounder, and M1 triad in all time stats. It needs to be fixed, rambo needs to be dealt with, but it has to be as part of a widespread fix, or there will only be more and more bad feelings and troll responses. And Choad, clearly CRS does base certain things on very unreal "real-world capabilities", or do you think 1930s/40s trucks can freewheel over 4500m without power? You will not find a post from me defending how a truck can coast off road for the amount of time it does, especially the Allied trucks. Or even minimizing it for that matter. In fact, I have have supported the idea of fixing something that gamey. all fine and dandy BUT. Was just in Bunker Nandarin opposite side of the Bunker radio deployed i might add. Who runs up the stairs 2 rifle guys well its a real tight path way and they turned my way open up as soon as i saw brown . WOULD you guess both of them ran right throu my drum ( that would be 50 bullets) of bullets and i got killed by a Rifle, NO RAMBO on my part used it the way it was ment to be and i friggen lost to 2 Rifle cause either my bullets didn't register or my bullets magical went around them. Came back twice to try to retake and kill EI in Bunker but ohhhh my MP34 killed 1 out of 3 and i got killed , 2nd try i didn't even get a kill cause the Allied SMG cut me down , and i wasn't the only one trying and none of us made it into the radio room . Not one of these 3 should have been in that radio room cause my LMG was set up across and another SMG in the radio room , but for some odd reason that SUPER LAZER HEAT SEEKING ALLIED SUPER DUPER KILLING LMG , that supposedly clears a room of 20 ALLIED in a CP couldnt kill 2 lousy EI ,coming up steps turning into my path. the vehicle game is too complicated to make a judgment based on kills and deaths. it's like comparing the panny to the 232, each piece can be soo different it might as well be in a separate category. even total armour numbers are messy: people include the 232 and 2c as well as h35 and new CAS tanks into complaints about armour supply balance. we had some good talks in the motor pool last year and figured the panny is screwing with the balance, giving axis 10 more tanks and another 15-20 inf-killing tanks. overall they're balanced, but axis have almost 40% more inf killing ability. I understand it's frustrating. I think network latency and lag issues are a seperate conversation though .... affecting all infantry, not just the lmg. I certaimly feel your pain .... it seems to come from both extremes. 1. No way that guy turned, saw me, aimed and fired that fast .... killed me before i could squeeze the trigger. 2. I unloaded a clip in the dude and he just walked on by and then casually killed me. From my axis point of view, the suggestion of changes to LMGs, specially limiting their actual use, sounds to me like a suggestion from crs to "lets change the DB7-s of ALL sides so they cant loop as they do" into allied ears. Cause Axis feel their LMGs as one of the few real good weapons in the game. Allied lmg doesnt count as a real threat to axis. So any change counts just for the axis LMG. And so I understand very well some comments here from axis players. From my player point of view, the most unrealistic I see is the reload while standing and having all my magazines always full when reloading, for example. In regards to dispersion, not sure how others work, but if I enter a packed by eis depot, my lmg is able to shot down 0, 1 or 2 eis as much, cause the others quickly kill me. If someone is able to enter that depot and kill 6-7 enemies in the assault, he can do it with any lmg or smg cause its a matter of his ping/latency, not due to a WWIII weapon shot from the hip. Still I would be up for a dispersion Audit, but as someone has said it could improve its lethality since one single bullet kills anything, so beware on this. Any change, if its "realistic" and based on historical info, its good to my eyes. One campaign won’t give a good idea. However, K/D over the lifetime of a piece of equipment can give you a relatively reasonable idea of a weapon’s overall effectiveness. That triad is officially gone. As well as the T1 Stuart. Not to mention the change I just mentioned is far more significant from a game balance perspective than fixing a broken mechanic that's been in the game for over a decade (rambo LMGs). then there's the pak38 vs sherman and 6lbr/M1 vs 4g, the allied guns are up to twice as effective. it only gets more complex going further into older stuff... matty, Stu, 3H, Dac, 4B & 3B, 2lbr... all need to be thought of as separate groups instead of "axis tanks kill # and allied tanks kill #". I don't disagree except for the fact that ATGs are a one trick pony. Their sole purpose is to engage tanks. Can they kill other stuff? Sure on occasion yes but I don't see too many people that grab ATGs to cut a CP. ATGs don't have the kind of secondary effects you are discussing. Furthermore I asked about the group of ATGs that I did because they end up being the work horse ATGs of their respective armies given their ability to spawn from depots.